Cooking Foodie : Born in a food loving Gujarati family, I grew up on scrumptious meals cooked by my mother. On occasion my father would step into the kitchen to create a masterpiece. Education was important too and I got a Civil Engineering degree from University of Mumbai. Later I came to US to get my Masters degree in Civil Engg. from University of Florida. That is also where I met my husband. US also opened my eyes to a whole new world of food and drink. It was not just Amul cheese and Wills bread but artisanal cheese - more than I can eat and artisinal loaves which I have grown to love, all different textures and tastes. I also started cooking more cuisines here and expanded my knowledge of food and processes. Cooking Foodie : I love to watch food network and I love to eat out and do so often. Cooking Foodie : I started my food blog cookingfoodie.blogspot.com to chronicle my mothers recipes and my own. I crossed a 100 followers and I am thankful to each and everyone of them for their support and encouragement. Nithu's Kitchen : What was the first dish you made. Cooking Foodie : I always loved food and my first dish was onion bhajji which I made because I didn't want to eat the roti sabzi mother had made. After that there was no looking back. Everytime I didnt want to eat the food cooked (pretty rare) or planned, I would make something I liked, usually a snack or a non-traditional item. Nithu's Kitchen : During your early days of cooking, what was your speciality dish. 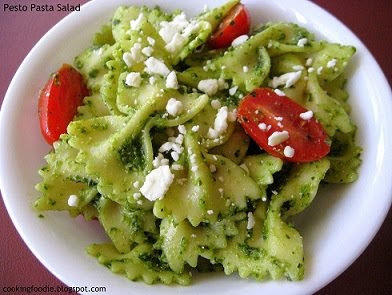 Cooking Foodie : Pesto Pasta Salad is a simple summer salad. This salad has simple ingredients and can be made in a jiffy. Some pasta shapes are easier to coat than others, I used farfalle, bow-tie pasta as they are better in this dish. For some saltiness, I use feta cheese which has a bite and goes well with the basil notes of the pesto. Cherry tomatoes are little bombs of flavor. They have the concentrated taste of tomato in each small bite. Buy the snack variety and preferably organic as they will be eaten raw. In a large pot boil about 9 cups of water till it comes to a rolling boil. Add salt and pasta and cook till al dente. It should take about 8-9 minutes. Drain the pasta, place in a large bowl and add the pesto to it. Toss well to cover evenly. Add the tomatoes and half the cheese and mix well. To serve sprinkle some cheese on top and enjoy! Nithu's Kitchen : Thank you so much. Cooking Foodie : Thanks Nithu. Wow Nithu - Thanks again. Its great to see this on your blog! Glad to know more about Cooking foodie,love her space for her beautiful dishes..
looks so yummy ! will definitely love to try at home ! Pls collect an award for your wonderful blog at my space.. I am enjoying reading your posts. Interesting & yummy both.